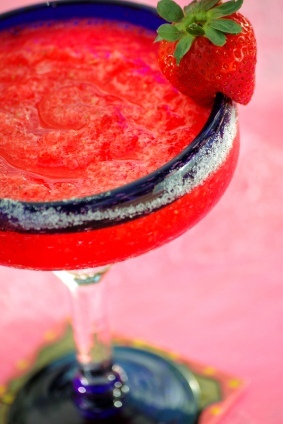 This is the best homemade strawberry margarita recipe from scratch. This hits the spot on a hot day. Fresh strawberries make perfect margaritas. 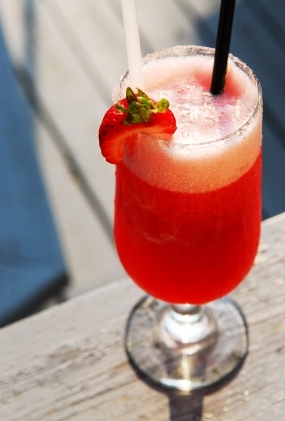 Don't forget to check out more strawberry cocktail recipes below. Offering three different ideas for drinks using fresh strawberry puree (even make strawberry juice). Place prepared strawberries in blender and process until smooth. Optional: Pour into a fine mesh strainer over a small bowl to remove seeds. Wet the rim of your glass and dunk in white sugar (It's good with sugar/salt mixture also). Pour strawberry puree into the blender with the remaining ingredients; process. If you want the drink slushy, add some ice or you can pour the it over ice. Add more tequila or sweetemer if you wish - it's your margarita. Just make note of what you did and it will be perfect next time. *To make it sugar free, you may use fresh strawberries and add Stevia to taste before you fill your glass. Please feel free to adjust to your own tastes. I first saw this at Crate & Barrel. What a time saver - I don't know what I did without this strawberry huller. Strawberry lovers rejoice (I did do a little dance)! Now that I am on the strawberry margarita recipe kick, I thought I would offer another refreshing cocktail to the masses. Put the rum and lime juice into blender, and add sugar. Process until dissolved. Add freshly sliced strawberries and blend until smooth. Pour into glasses that have been chilled and rimmed with sugar (just dip rim of glass into lime juice, then dip rim into sugar). Slice the end of a strawberry half way up and place on the rim of the glass. Enjoy. Use fresh strawberries when in season and purchase frozen strawberries any other time. If you are using frozen, add a few at a time when you blend them, repeat. If you want a lighter cocktail that has strawberries in it, be certain to check out the next strawberry cocktail recipe. I have more strawberry equivalents for you; they are handy when you need them. If you have strawberry puree on hand, you are in for a treat. This is the base for several cocktails. You may also do this with peaches, blackberries and raspberries, or try something new! Place the above ingredients in a blender and process until smooth. At this point I taste it to be certain I don't have to add any more sugar because sometimes the strawberries are not as sweet as you think they are. You use super fine sugar because it dissolves much faster then regular granulated white sugar. Don't like the strawberry seeds? Make sure you have the correct sweetness and place the puree through a sieve. Now, what's a girl to do? At this point, you may even make fresh strawberry juice. Just take 3 or 4 tablespoons into 5 ounces of water. Add ice (and a little vodka) and you have a refreshing beverage. Want a little more of a kick? How about a strawberry martini? 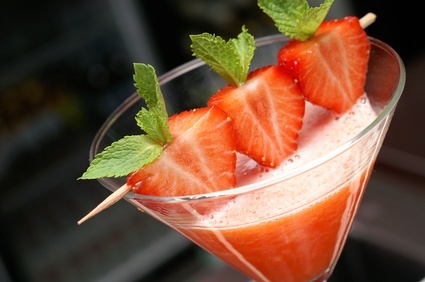 Again use 3 or 4 tablespoons of the strawberry puree with 3 ounces of your favorite vodka (Belvedere). Place in a shaker of ice and shake until ice cold. Place in a martini glass that has sugar around the rim. Looking for something light? Place 3 tablespoons of strawberry puree into a glass and add champagne. You may even freeze this puree and use the frozen puree to keep the cocktail cold. This makes 2 cups of strawberry puree (approximately 6 drinks). Any more ideas? Please share with us below.